Shirts With Random Triangles: LSU gets class of 2019 commitment from four-star OT prospect Kenyon Green. LSU gets class of 2019 commitment from four-star OT prospect Kenyon Green. Kenyon Green. Image via hudl.com. The recruiting season for the class of 2017 is in its closing months, but it already has the fourth commitment for its 2019 recruiting class. 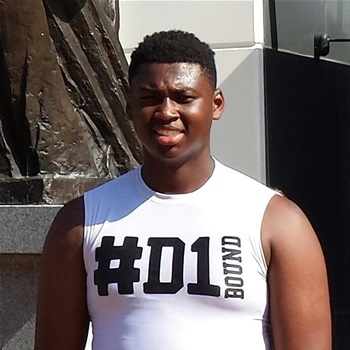 Humble, Texas high school sophomore offensive tackle Kenyon Green announced his commitment to the Tigers on Sunday. 247Sports.com grades green as a four-star offensive tackle prospect. The recruiting site's Class of 2019 rankings lists Green at no. 8 among OT prospects, at no. 6 among prospects from the state of Texas, and at no. 75 in its national overall rankings. Green attends Atascocita High School in Humble, Tx. He stands 6'5 and weighs 300 lbs.